With a huge range of water features to suite any garden or courtyard in Melbourne, first consider your overall garden design, as well as your personal taste for the ultimate solution. Designs are constantly changing with suppliers with classical fountains, ultra modern and even custom made designs available. Suppliers can provide you with the right option to suite both your garden and your budget. Water features add a sense of tranquility to the modern courtyard or garden. From a simple plug in water feature to hand crafted natural stream, water features are increasingly used in Melbourne’s, landscape designs. With both classical and contemporary style water features available, landscapers and gardeners can now add a range of accessories that will make outdoor living more enjoyable. Accessories such as pond vacuums, UV filters and pond pumps can make maintenance easier. Pond lights, including submersible LED lights can be easy to install and add an extra dimension to the water feature at night. Goldfish and Koi, along with water plants can add interest year round. Spillways, water blades and water spouts can be incorporated with lights to add a touch of class to many designs. Pond liners, leak sealants can also be found to solve most leakage problems with ease. With such a large range of water features and fountains available for Melbourne, choosing the right design is important. Size is important, as with all garden design the scale of one element in regards to the others needs to be considered. Larger water features suited to larger gardens and courtyards will not be suited to a small courtyard. In smaller areas such as the terrace houses and smaller units that are found throughout Melbourne a small wall mounted water feature can fit well. This is also true for narrow spaces. Style and design are also considerations, suppliers offer a range designs from using a range of materials from steel and glass for a contemporary look to granite stone, and bamboo designs. Japanese style water features include the Shishi Odoshi, made from bamboo, stone bowls and statues that fit in well with Japanese grasses and dwarf maple trees. With such diversity home owners and landscapers can choose from off the shelf ready to install models to individual and ‘built on site’ designs. With a little thought and imagination a design to suit the smallest courtyard or larger established garden. Look for suppliers with specialist knowledge of products, pumps and installation, ask about delivery and guarantee and compare costs. From a small reflective bowl to a classic fountain, water features have a place in the garden of today. 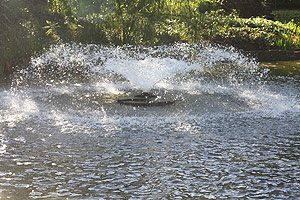 Why not install a pond with a water feature in your garden? Interested in how to install a garden pond… we tell you how. From a small reflective bowl to a classic fountain water features have a place in the garden of today. Why not install a pond with a water feature in your garden? Interested in how to install a garden pond… we tell you how.